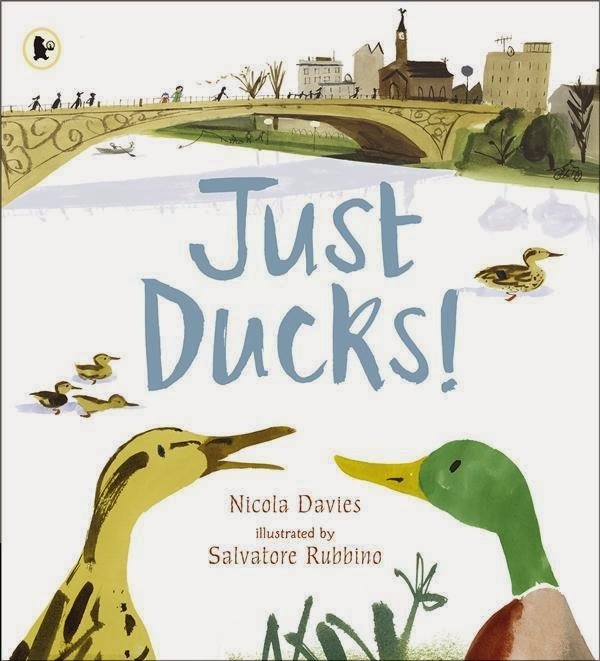 Home » Animals » Junior Non-Fiction » Picture Books » Reviews » Reviews by Tania » Tania McCartney » Review: Just Ducks! I must admit, I tend to follow the books of illustrators as much as authors, and the books of artist Salvatore Rubbino are some of my very favourites. The fact that, in this case, Just Ducks! has been co-created with author Nicole Davies, hits a sweet picture book spot, because I adore the work of both these talents. 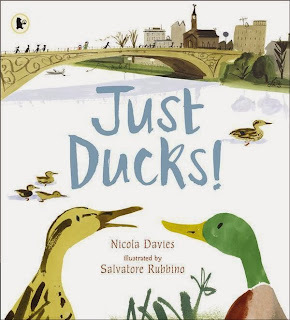 A classic-style picture book in the Walker Nature Storybook series, this blend of fiction and non-fiction follows a young girl as she marvels at and enjoys the quacking ducks who take up residence on the river outside her home. They swim, they eat, they quack, they preen--they dabble, dive and upend. Our girl goes down to the water's edge and delights in their antics. Some even come close enough to check her hand for food. And all the while, as the story unfolds, we are treated to a lovely narrative, accompanied by fascinating duckish facts. For example, did you know that the mallard female's quiet colours (as opposed to the male's brilliant hues) help her hide from danger when sitting on her eggs? And did you know that preening spreads oils throughout their feathers to keep them shiny and waterproof? Delightfully-presented information is laid out in charming scenes, showing the ducks in their natural habitat, and the girl's interaction with them. Rubbino's gorgeous, watery illustrations are just a joy to ponder over and the QUACK QUACK typefacing couldn't be more perfect. Fabulous for schools, this is a superb faction creation. Includes a short index and additional information at the end.